Pool owners can find endless types of pool floats, rafts, and accessories for an enjoyable summer. So how do you choose the best for your swimming experience? When shopping for the right pool raft, you need to consider more than your personal preference. You will want to take into account the size of your pool, material, purpose, and the age of the user. 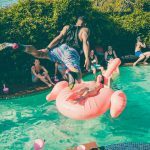 Whether you opt for a pink flamingo plastic float or a foam noodle, this guide will ensure you spend more time in your pool than in the store. A raft that lies flat on the water, typically with a pillow section to support the user’s head. The flat design of a pool raft does not support the excessive movement or paddling around the water. Instead, users need to lie down on their back or stomach. If you are looking for a flotation device to sunbath or relax while lying flat, choose a pool raft. Pool floats prop the user up in a sitting position. The sitting design of a pool float makes it more suited for floating leisurely while reading a book or watching children play in the pool. It may be more difficult to tan or rest on a pool float due to the nature of sitting rather than lying flat. Some pool floats have a long length, keeping the feet out of the water while others allow the legs to dangle in the pool. Some pool floats even feature a drink holder embedded in the sides. Foam pool accessories consist of a soft foam core covered in a vinyl outer layer. Rafts are typically made of foam including the pillow section. Foam pool rafts are available in various widths. Foam rafts offer durability even when pierced or punctured. Additionally, the foam makes the raft very thin allowing you to lounge close to the water. This creates the effect of barely skimming the surface of the pool. The thinness of this material allows these rafts to be easily stored in smaller places. However, these floats have difficulty collapsing and tend to weigh more. These accessories will still float even if punctured, allowing them to last for many years when properly maintained. Inflatable floats require users to inflate the device on a regular basis. Smaller pool accessories are easier and faster to inflate than larger ones. Using an air compressor can take the physical work out of blowing up these types of floats. Choosing an inflatable raft or float gives you a larger selection than foam. Easy to store, inflatable pool floats are an ideal option for travel and pools in seasonal climates. Inflatable floats are also relatively inexpensive due to their single layer of material. Keep in mind that inflatable floats may experience a puncture; but patch kits can help contain a leak. Classic Pool Floats allow a user to lie flat and relax on the water. 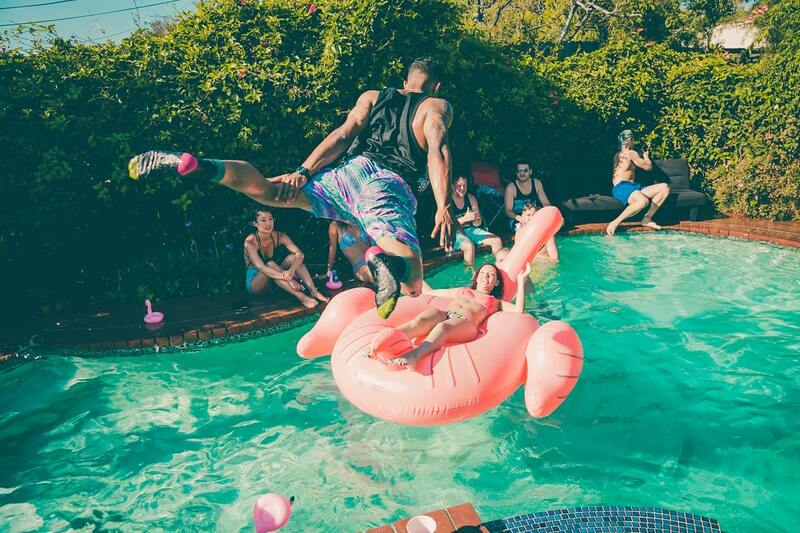 Pool floats can be inflatable, foam, or mesh. The mesh material allows water to flow through the float. Side-by-Side Pool Floats can seat two users who want to spend time together in the pool. Side by side floats allow the users to face the same direction or for the pair to sit head-to-toe and face each other. Family Pool Floats hold many people looking to float together in one single device. Think of this float as something similar to white water-rafting boats, but with added comfort. The circular design features built-in seats, allowing each passenger to face the middle. The middle typically has an opening so users’ feet can dangle in the water. While these floats will keep the entire family together, its large size requires extra pool space. Fun Pool Floats provide flexible movement and entertainment in a fun variety of colors and shapes. You can choose from animal shapes like flamingos and swans, to junk food shapes like pizza. Pool noodles still remain a pool accessory used for swimming, floating and rescuing. Before you buy your pool float or raft this summer consider all your options from the material, size to your pool’s environment. The right pool float or raft can make your pool season fun and memorable whether swimming in the ocean, lake or in your own backyard. For the latest tips and trends regarding pools, contact Shoreline Pools today!